All the world's a stage, and all the men and women merely players. Different scenes call for costume changes. If you don't believe it, think back to your last job interview. I don't know about you, but I wore a suit. I dress up for a night out and dress down for a night in. I wear my leathers when I ride, and I have a set of clothes for the garage. 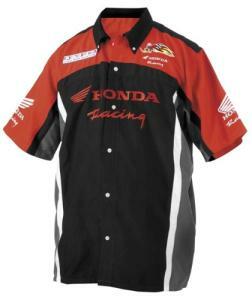 Donning the Honda AMA crew shirt is an excellent way to get into a wrenching mindset. Styled with the unmistakable lines of Honda's racing crew, I wouldn't wear this when you settle in to work on your Yamaha, unless, of course, you have a sick sense of humor. Not quite over the top, this shirt can be worn out into the light of day, so long as you don't mind people knowing your passion for Honda motorcycles. Perhaps not fine dining garb, but it wouldn't hurt on a first date to make sure everyone knows what they're getting involved in. Seriously, however, this shirt will wear comfortably well at any riding event or in your garage. Honda put their name on it, and that should give you some peace of mind. Whether or not your personal style permits this bit of apparel into your closet is something you already know, so I'll just tell you that it'll run you a measly $60 or so.